Why is this promotional skin membership right for you? We have designed this membership to be taken up over a 3 month period as great skin and amazing results don’t happen over night, they come from dedication and commitment, not only from your skin therapist in salon but also from you, our lovely client. By committing to this membership you’re committing to great skin with long lasting wow factor results. You will notice a smoother more youthful, hydrated, tone and texture to your skin. We will provide amazing results in salon but you will also receive advice on how you can assist at home in achieving the end goal. AMAZING looking skin! 70-80% comes from home care. Microdermabrasion: is a facial treatment we are sure you have heard many times over, why we chose this as part of the treatment combination is it delivers instant results by resurfacing and removing all dead skin from your surface layer of the skin (the Epidermis). Cell turn over and renewal is so important as we get older because our cell renewal rate slows down dramatically, so we need to assist in keeping those cells turning over, to stay looking younger longer. LED: light therapy is another fantastic treatment as a stand alone or even better as an add on treatment to any of our advanced facial treatments especially peels. How LED light therapy works is it accelerates, results by speeding up the delivery of active ingredients and stimulating collagen, our main structural protein that assists in keeping our skin firm . Creating a more youthful, brighter skin texture. Anit ageing Peptide mask: Wow factor finish! This cooling gel mask will soothe the skin after your microdermabrasion, leaving your skin feeling more nourished, hydrated and firmer. You might ask what are peptides?…. When amino acids link together, they form chains called peptides, when peptides form longer chains of amino acids, they become the building blocks of collagen proteins, which in turn then creates a firmer skin. If we haven’t convinced you yet then read further. The bonuses we are offering are so much more than we have ever included before. Why are we giving away so much!? Because we want to deliver you results, results, results and the best way to do that is to combine advanced facial treatments with high-grade active ingredients over a minimum of a 3 monthly facial programme. EXTRA BONUS: With in your 3 month membership period you will also receive 20% of ALL other treatments and Skin care. This is a great opportunity to invest in you and your skin, as we want your skin to succeed. Lets get spring ready. This membership is so amazing we are only able to offer a limited amount of them. Call the salon 8883 5350 and our friendly skin therapists will be able to assist you in being able to lock down your spot. You can pay monthly or up front. 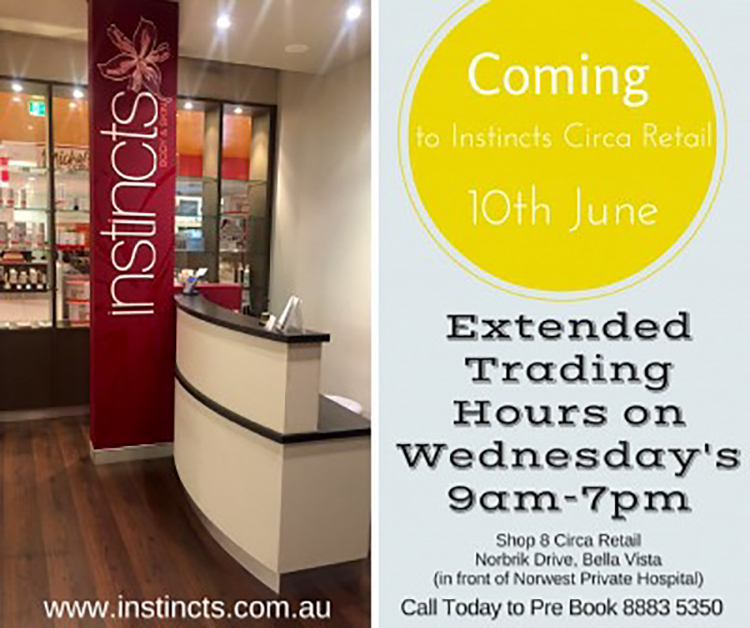 The team at Instincts Beauty Salon in Circa Retail, Bella Vista are so excited to be able to now offer their clients later appointment times. So if you are wanting that quick eyebrow wax or even Bikini wax after work we can now do it for you. For time poor clients that want their Facial or Body Massage, you can now do it after hours which can free up your weekends. Head down to Instincts Beauty Salon at Bella Vista today and visit our amazing Beauty Therapists. They are waiting to to give you a Beauty or Facial treatment you will never forget. At Instincts we believe that ours Mums should be thanked all year round but lets face it we forget sometimes.So the team at Instincts Body & Skin in Norwest Marketown Baulkham Hills and Circa Retail, Bella Vista have put together a package for the special day coming up MOTHER’S DAY. So grab a gift voucher or even book in for yourself. Help Instincts raise money for a great cause. 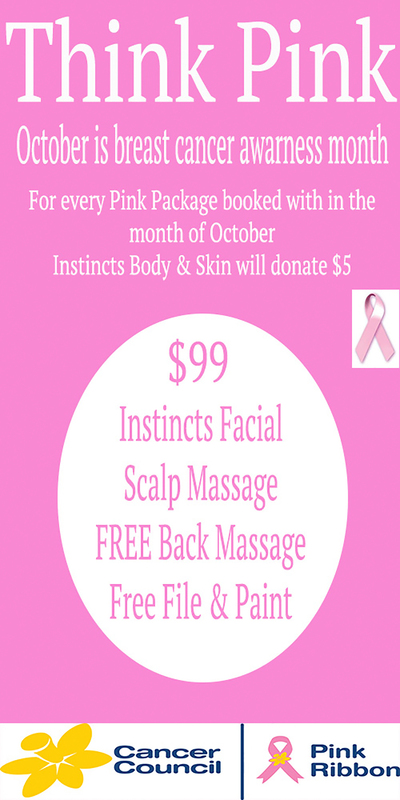 This is close to all of our staffs hearts as we all know at least one women who has battled with Breast Cancer, Instincts Body & Skin at Norwest Marketown and Circa Retail in Bella Vista would really appreciate if you would help us contribute, you also can treat yourself to a fantastic facial and massage.